Appendix A (149 pages) : Select documents pertaining to ICE enforcement tactics obtained in the Immigrant Defense Project et al. v. ICE et al. FOIA litigation. 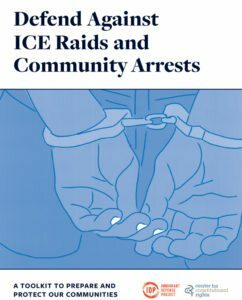 Appendix B (50 pages): Reports of raids collected by IDP, broken down by the identified ICE tactic, demonstrating the range of strategies used in their enforcement actions. Appendix C (7 pages): Press coverage on the human toll of raids. Select stories that have been in the press humanizing individuals who have been subject to ICE enforcement. Visit here for other resources related to ICE raids and community arrests, including Know Your Rights flyers and emergency preparedness tools. Based on years of community defense experience, litigation, and legal research, including hundreds of first-hand accounts of ICE raids from immigrants, our joint #stopICEcold toolkit offers social justice advocates, lawyers, and community members critical information and analysis of our country’s massive detention and deportation system, as well as straightforward guidance on how to prepare for the ICE raids. ICEwatch, an interactive map that details ICE’s deceptive and aggressive tactics with summaries of over 650 raids.